dreamsketches: Baby Birdies, Baby Birdies! I've been trying to get my 5-year old nephew Hassan (or more properly, Hassan-bo-bassan) familiar with soccer in the mornings. A few days back, he noticed something near his swing set during practice time. Apparently, the not so wise mom built a nest on the swingset/playhouse that was doomed to fall. 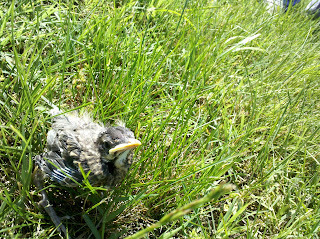 One poor birdie died :( Two others were alive and not moving, stuck on their backs! Well, if this ever happens to you too, hopefully this can help you. 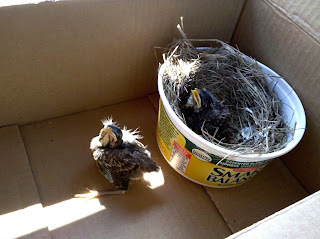 The nest was intact so I put it in an empty butter container and put the survivors inside. Songbirds have a bad sense of smell, so there are no worries that the mom will smell humans and not return. The hope is that they will fly very soon. By the way, the mother does nearly attack when anyone gets close to her babies. Hey, not our fault she kinda messed up! These little creatures seem so inconsequential in the grand scheme of things, right? But it's a reminder to me of the tremendous value of life. We were so concerned with these things - but why? Neighbors on the left and right came to visit them, bringing food (like worms mmm) and boxes for the birdie folk to reside in. It might sound ridiculous but there's a significant example of our innate drive to help, to nurture, to revive. Well, especially if the objects of our affection are super cute.